Once again, Dunkin’ guests are getting the ultimate win/win: a great beverage inside the cup, and a chance to win great prizes on the cup*. For the second year in a row, Dunkin’ Donuts is launching “Sip. Peel. Win.,” the brand’s nationwide on-cup “peel and reveal” promotion. From August 27 through October 15, or while supplies last, every customer who purchases any large or extra-large sized beverage (excluding hot espresso) at participating Dunkin’ Donuts locations will receive a “Sip. Peel. Win.” game piece stickered on their cup. This year, “Sip. Peel. Win.” offers millions of instant win prizes, including free Dunkin’ coffee for one year, free Dunkin’ Donuts menu items, $500,000 worth of DD Cards, JetBlue® Roundtrip Tickets, Fanatics® sports gear, Fandango® movie tickets, K-Mini PlusTM Keurig® Brewers and more. There are also valuable coupons that offer discounts on Dunkin’ Donuts products, movies to watch at home on FandangoNOW, Fandango’s on-demand video streaming service, exclusive movie merchandise from Fandango FanShop, and Fanatics sports merchandise. Additionally, guests can collect pieces specially marked with a suitcase or compass icon to win a Grand Prize JetBlue Vacations package, including a pair of JetBlue Roundtrip Tickets and up to $1000 for a hotel stay at any JetBlue Vacations Destinations. Dunkin’ Donuts is the exclusive coffee provider of JetBlue, with Dunkin’ Donuts coffee and tea served onboard all JetBlue flights. As this year’s “Sip. Peel. Win.” promotion launches, Dunkin’ Donuts guests have some great fall-themed choices to enjoy in their cup, with the return of Pumpkin and Maple Pecan flavored coffees. Dunkin’s lineup of fall favorites also includes new Maple Cream Cheese, new Apple Crisp Donut, the Belgian Waffle Breakfast Sandwich, Pumpkin Donut, Pumpkin Muffin, Pumpkin Flavored K-Cup® pods and more. All will be available at participating Dunkin’ Donuts restaurants by August 27. *APPLIES TO LARGE AND EXTRA-LARGE BEVERAGES, EXCLUDING HOT ESPRESSO BEVERAGES EXCEPT IN CA AND HI. NO PURCHASE NECESSARY. 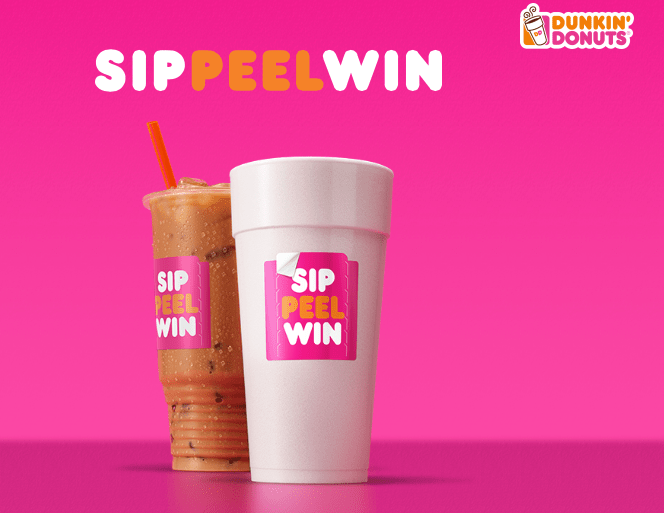 For Official Rules, including how to obtain a game piece without purchase, prize/discount descriptions and odds, visit www.SipPeelWin.com or a participating Dunkin’ Donuts location. 50 U.S. and D.C., 13+. Begins 8/27/18; Ends 10/15/18, or while supplies last. Free Dunkin’ Donuts product and discounts only redeemable at participating U.S. locations, excluding airports, stadiums, universities, transportation centers, Speedway locations, and other locations unable to accept coupons. Redemption terms apply, incl. expiration dates. Game Pieces subject to verification. Void where prohibited. Sponsor: Dunkin’ Brands Inc.